This looks super cute. Nice work. @JctWood : No great secret to it I don't think. We tend to use two major light sources in a scene with a fairly bright ambient light. Our textures are usually fairly muted (I have a thing for muted colour palettes) and we use Specular/shininess pretty sparingly. I spent quite a long time playing with colours to make sure it all gels together ;-) Glad you like it! @MrHelmut : Love TRATEOTU, definitely an inspiration for our space levels : ) and please do add us to your list. We have the beginnings of our own list of people to send the game to when it's ready to leave the nest! @Andrew Brophy : Thanks, glad you like it! We're also using a star system (kitchelin instead of michelin ) which you can get a hint of from the GUI in the above gif. It's a fairly standard system but it means we have a simple currency for players to use to unlock new levels. Also been fighting with GUI art this week, definitely not something I have a huge amount of experience with but hopefully I'll have something for you guys to look at/critique soon! That world map.... looks so wonderful! Is only one player able to control thomas currently? Also, I use to have an orange cat. That's cool! I feel like it could do with a red/green light on top of the door to highlight that it's linked to the switch, and to make it really clear when it's open or closed. I don't know how come I've managed to miss all the updates until then but very excited to hear of the space-themed level!! 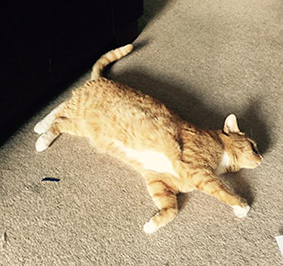 Is there any possible chance to change the colour of the cat? That way my girlfriend and I can play as our cats. Haha. The game looks amazing! Do you alredy have some audio and can you tell us something about your references regarding art? UPDATES: This week we have been working on a trailer for the game. We showed a very early draft to some fellow devs who gave us a lot of great feedback on how to really polish the art to make it look as professional as possible. Think I still need to play with the values some more but feels like it's a step in the right direction. Do you do much with the camera during gameplay at the moment? I think some very subtle movement, possibly becoming more exaggerated/quicker and zooming in slightly as the orders start piling up, could add a nice touch of panic to things. It would give it a handheld camera feel, which wouldn't make sense given the viewpoint but could still add a touch of drama/urgency. This game looks rad! Who would have thought cooking could be so groovy? One suggestion! If you mess up a dish, some of the diners should walk up to the take out window thing and throw their food back at you! That would be funny. Also this game kind of reminds me of some of the N64 Pokemon stadium minigames. First off apologies for the appallingly long delay on this update, we've been working really hard on the project over the last few weeks and have started to make some real headway. Definitely the hardest part about indie dev so far has been balancing making the game and remembering to actually tell people about it! @Ishi - We do a little bit, but we could definitely do more, at the more it tries to track the characters as they move by panning but I think this actually impacts player accuracy a little so we're tempted to try zooming rather than panning. Also I'd love to try and add more camera shake and general play feedback using the camera! @Strkl - Thanks so much! Yeah, it's make a big difference to the visuals I think! 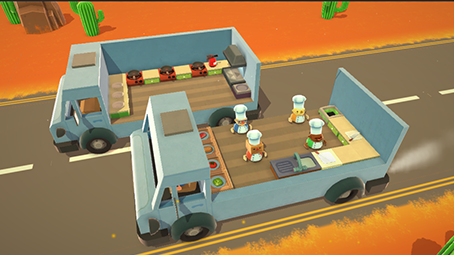 Inspired by the Uncharted series this level involves moving between two moving food trucks to cook up some tasty burgers! Other new levels include: Our first pitch dark levels which require players to memorize the location of different kitchen appliances. 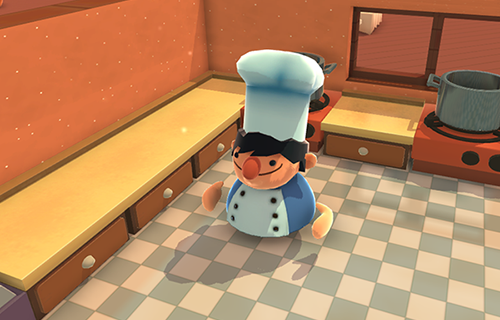 A control room level which requires half (or less) of the team to man a series of pressure switches to help the other player navigate through the kitchen beyond. A boat level which slide in 4 different directions, each time revealing new paths and closing off old ones. Now that we have a good selection of levels we're going to throw them into a world map and give them a rough unlock order so we can start testing that side of the flow. I really adore the adventurous environments going in to the game! Oh my god this game is really going sick, I didn't think any second we could go so far out of this concept. 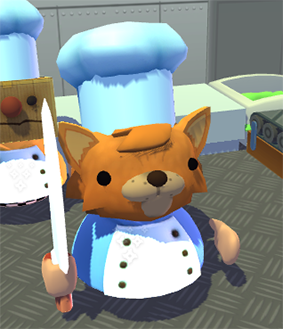 This kitchen galaxy level is mental! 25 levels!? That's insane. How many do you plan on making? I'm buying this game for sure when it's done. Looks amazing. I'll gladly volunteer as an alpha/beta tester if you need one.